I suppose it would be fair to call this part 3 of my LA trilogy; 3 posts that capture elements of my trip to LA 3 years ago. It's taken a long time to reach the page but the memories are still vivid! Parts one and two can be found here. Dislocation: Over the years I've learned that there's a certain reassurance to be gained from the experience of dislocation, I'm even tempted to say that it can be life affirming. For me it relates to that rare feeling of release experienced when surrendering yourself wholly to your immediate environment, relinquishing control to outside agencies and forces, to recognise, in that moment, you are being "held" by someone or something else. One example of this that many of us have experienced is flying. Think of your last flight and cast your mind back to the moment the plane takes off; in that moment you are at the mercy of the elements, the interplay between wind and wing, aileron and airspace, the nuts and bolts of the aircraft, conversations between cockpit and control, the skills of the plane crew and so on. In this instance, in terms of safety, time to destination, route taken etc, you are powerless, there is nothing you can do, you have relinquished control and you are free from any responsibilities other than to yourself and your fellow passengers. While for a few, this represents a somewhat scary scenario, for some (me included) it represents an opportunity to experience tranquil dislocation. Anxieties experienced at such times are, to be brutally honest, a waste of emotional and physical energy. Emotional distress is often associated with the fight or flight response (no pun intended) in which we confront that which is causing us stress/anxiety (i.e. fight) or we remove ourselves from the situation (I.e. flight). Here's a paradox....in this example, when you are airborne, flight is not an option! To those gripped by acute anxieties related to such experiences and those who, to a lesser extent, have difficulty relinquishing control in their lives, this might seem challenging, but you can choose how you experience such events. Worry, anxiety, stress have absolutely no value in such situations - your influence on the situation is minimal at best, so why worry? The more adaptive emotions might be a feeling of relaxedness, of focus, of freedom, opportunities to gain a deeper awareness of ones self. It might sound somewhat simplistic but the reality is that we all have choices in these situations, we may have to learn what range of choices we have and then learn the skills/habits in order to exercise those choices, but they are there to be had. My flight to LA was physically challenging but psychologically invigorating. Alongside the flight to LA, travelling to spend an evening of dramming with @redwhiskybar (Rob Throckmorton) was also a moment of dislocation. I'm not referring to the meeting with Rob, (I'll covers that when I expand on "connection"), but to the short journey in the cab to our venue for the evening. The twenty minute journey across LA, in a cab who's driver spoke little or no English, along a packed freeway, in the still sticky early evening heat, was a moment of dislocation. Twenty minutes to let the imagination run free, to relax, to anticipate, to forget, to remember, to take in the surroundings, in short.....to be free.....and then back to reality as the driver indicates that we're at our destination. Connection: One of the enduring attractions of connections made within the whiskey community is the privilege of encountering people with passion. Passion is a word spoken with a regularity that, on occasions diminishes its potency and meaning (the word "awesome" is probably the most well-worked example of this). I suspect that there are many people who meander through life in a soma like contentment without experiencing passion from one year to the next. Passion is infectious, contagious, it is an interpersonal currency that opens doors, creates bonds; it needs attending to, nurturing, it can be claustrophobic and, if confined, it will wither, it needs to be allowed to express itself, to be seen and heard. Needless to say, the whisky commnuity is full of passionate people. No entry ticket was required to gain entry to red whisky bar, the seeds of an invitation had been sown on Twitter many months prior to the trip, frequent humorous exchanges and thoughtful explorations of all things whisk(e)y had nurtured the whisky bond and I felt it only fair to bring along an offering, in this instance, a bottle of Ardbeg Uigeadail from travel retail. The evening started well, had a good middle, and ended splendidly. The theme was, not surprisingly "all things whisky". Experiencing a shared passion is one of life's pleasures; it is to be savoured as you might savour the whisky itself. Mein host for the evening Rob, is as passionate as it get when it comes to whisky, not only that, his passion comes with a wealth of knowledge about the product. I think it would be fair to say that his particular niche passion within the whisky world is rye and whilst not having any fixed agenda for the evening, it was clear that he was keen to devote a reasonable portion of the evening to this area.....but a "ryeathon" this was not! Whilst it may have been useful to have had detailed tasting notes for each of the whiskies, to have taken time out to put pen to paper would have detracted from the experience of the evening. Whisky is not my "work", but is a conduit through which I experience many pleasures. For me, remembering the details isn't the be all and end all, indeed, it can at times be a distraction. The evening was about different levels of connection, and I've seen too many evenings fractured with frantic scribblings of half thought through impressions to let that happen here. Our conversation occasionally delved deep into whisky theory and speculation (different types of peat, the impact of water, organic ingredients, and so on), but for me, the evening will be remembered in the context of simply sharing whiskies with a fellow passionista. We began with a straightforward and exciting exploration of West coast whiskies but as the evening progressed and our conversation became more animated, Rob conducted the whisky choices in response to the conversation, the whiskies "riffed" off the spoken words. I remember sitting on the red-eye a couple of days later, 7 hours into the flight, reflecting on the evening, I was reminded of the final scenes of Close Encounters of the Third Kind where Truffaut conducts the scene where a guy (using a cross between an organ and a small factory), responds to the alien sound sequences, building up momentum into a triumphant symphonic connection. The evening was well orchestrated and evolved into, well, a free-form jazz kind of experience. I was perfectly happy to see Rob move through different sections of his high quality collection, both of us becoming more animated as the evening progressed. Only occasionally did I purr with nostalgia at the mention of drams that were more familiar to me (Mortlach, Springbank). This prompted a visit to the "old friends" before returning to pastures new. We compiled a list of the drinks experienced "post event" as it were. If it looks excessive, that's because on some levels, it was! The drinks were never treated as shots, each drink (or pairing) was connected to varying levels of discussion and analysis. One experience firmly located in the memory banks! · Faultline Littlemill 21yr old 1990 vintage bottling by K&L exclusive to California - 59% (lush....from a distillery that lost its life in a fire x years ago). · Old World Spirits (CA) Gold Run Rye ; 45% 100% Organic White North Dakota Rye. Only six months old. · Red Whiskey Bar Whiskey - This was a lovely blend of 7 or 8 American Whiskies (one of Rob's creations), mostly rye, but one wheat whiskey, one bourbon and an American single malt, married in a medium char 750 ml oak cask for two weeks. · Firestone Walker Wookey Jack Black Rye IPA with a reverse chaser of Charbay R5 Hop Flavored Whiskey; 49.5% Literally a batch of Racer 5 (California) IPA turned into Whiskey. I'm a lover of the whiskey/beer paring and this was right up there! · Hirsch 20 Year Canadian Rye ; 43% Glenora distillery. · Lost Spirits Bohemian Bonfire; 59% California organic barley, Canadian Peat, freshly scrubbed French Oak cask. · Lost Spirits Ouroboros; 54% California organic barley, 4000 year old California peat taken from the San Joaquin river delta. A memory maker. · Mortlach 22 yr (1990, Chieftains, K&L Exclusive) ; 58% Ahhh, back on my turf with a Sherry Bomb, Oloroso! · Bunnahabhain 21 yr; 52.6% (The Exclusive Malts) Subtle rolling waves in this. · Anchor Distilling (San Francisco, CA) Old Potrero, 18th Century Spirit ; 51.2% 100% Rye malted mash. · High West OMG Pure Rye ; 49.3% New make. · Ardbeg / Chieftain's 17 yr 55.5% Barolo cask finish. 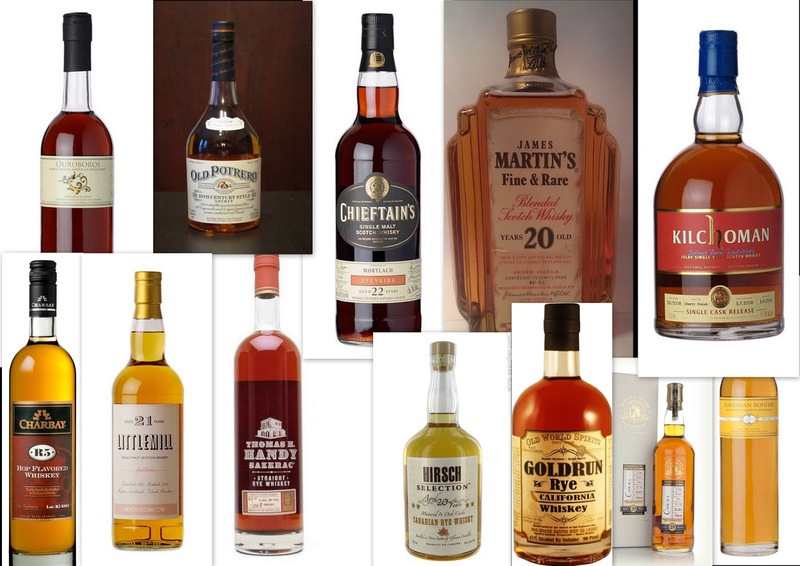 Some of the fine whiskies we sampled on the night! I have to admit that it was Rob's memory and a "morning after" bottle autopsy that enable us to put together such a comprehensive list. So, another stitch in the whisky fabric, a broadening of my whisky education, an affirmation of my passion for not just the whisky, but for the varied positive connections that seem to go hand in hand with it. A door opened in Los Angeles and the offer of an open door in the UK. Whilst I have a general rule that the whiskies I locate within my whisky shed have to have be full bottles that I've had/shared, I made an exception for the Ardbeg 17. Rob let me have the box and it's now a permanent reminder of the fantastic evening.....Cheers mate! An unexpected event that punctuated the evening was my first ever sighting of a real, honest to goodness, skunk! My childlike excitement almost resulted in a wildlife faux pas given that I was all ready to run outside to get a close up photo before Rob reigned me in with the appropriate health and odour contamination warnings.